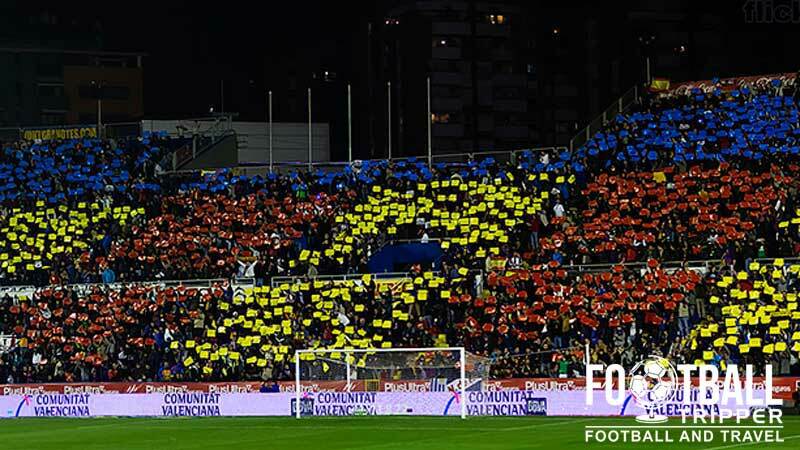 Estadio Ciudad de Valencia or in English, City of Valencia Stadium” is the home stadium of Levante UD, a Spanish side which currently ply their trade in La Liga. Built in 1969, the ground holds 25,354 and averaged around 15,000 in the 2012/13 season. Built next door to the site of San Miguel de los Reyes monastery, Estadio Ciudad opened on the 9th September 1969 when the home side entertained cross town rivals Valencia CF, who managed to spoil the party on this occasion. Plans to relocate away from Vallejo Campo were first formulated in the 1950s but as is the case with most football stadium projects, it took over a decade to get the necessarily approval from the local council, raise the required capital and review construction proposals from various companies. When the then 30,000 capacity stadium opened, it was originally referred to as Estadio Antonio Román, in tribute to the club President of the time who shepherded Levante’s relocation, but like a lot of Spanish stadium’s named after club figures, as time passes, fans eventually end up campaigning for name changes. Nou Estadi was a popular choice until fans eventually settled on the current name “Ciudad de Valencia”. 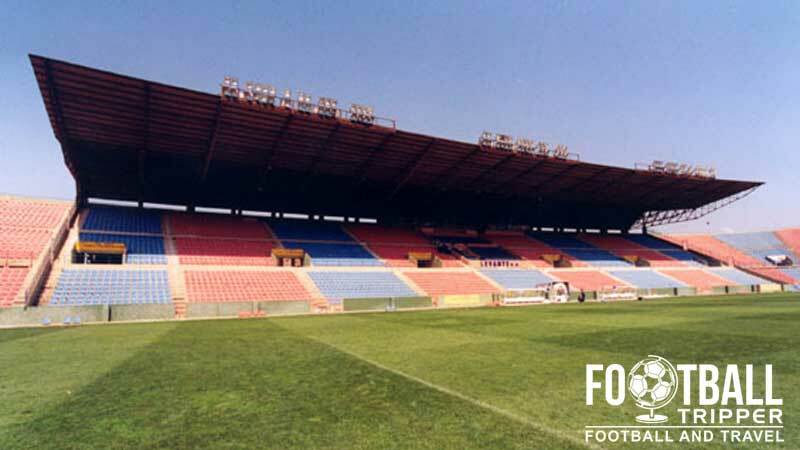 As Levante have remained a smallish club in the grand scheme of La Liga and Spanish football, the stadium has remained relatively unchanged since its inauguration, with the stadium being converted to fully seated in 1997 following a mandate from the LFP for safety reasons which naturally reduced the capacity by around 5,000 or so. Still, this redevelopment benefited the club in the long run with Les Granotes (The Frogs) participating in the UEFA Europa League in the 2012/2013 season which would have required some redevelopment to meet UEFA standards. The club reached the round of 16 after beating Olympiacos before being defeated by Rubin Kazan. Ciutat can be thought of as four sections: Gol Alboraya (North), Grada Central (East), Gol Orriols (South) and Tribuna (West). 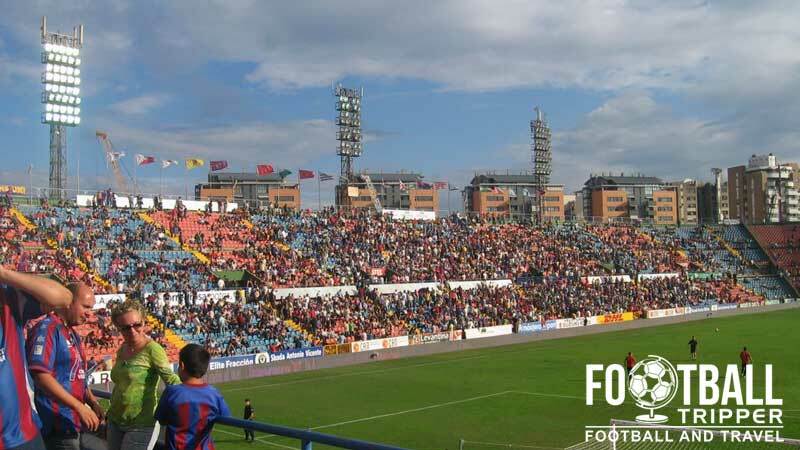 Away fans who make the trip to Levante’s stadium are housed within the north-west corner between the western tribuna and northern goal-end, essentially by the corner flag. Marked by the above seating plan by the colour grey, the visitors section is fenced off from the main stand and it consists of a single tier of uncovered seating. Surrounded by agricultural land to the North and a quiet residential neighbourhood to the South, the stadium is hardly sandwiched between the two most “lively” slices of entertainment, with a few smallish bars and restaurants totalling the choice of eating and drinking options within the ground’s vicinity. To the east there is a Burger King and a Pizzeria called Restaurante Pizzeria – Il Vulcano and if you’re coming up from the south there is Restaurante Casa Aparicio and Laylah Cocina Siria & española bar to quench your thirst. Of course within the stadium itself there are kiosks and places to grab a snack or something to drink such as a coke or a beer for a few Euros which is handy if you plan to absorb the Spanish way of life and get dinner out AFTER the game. The official Levante U.D website lists one store known as Tenda Granota at the following address: San Vicente de Paul, 44 46019, Valencia, 34 March, 22 04 902. There is also an official online store known as Tenda Granota. Note: Times may vary based on whether or not there is a bank holiday or if there is a match on. If there is a match on Sunday for example, I’d be surprised if the club didn’t open the store! The classy exterior of the Levante U.D store, shops look way cooler in continental Europe! Tours of Estadi Ciutat de València may be available to those who complete the online form, but there is no guarantee that the club will accept you as the “Visit Request” form is geared towards Schools. Still, there is no harm in filling in the form and seeing what they have to say! 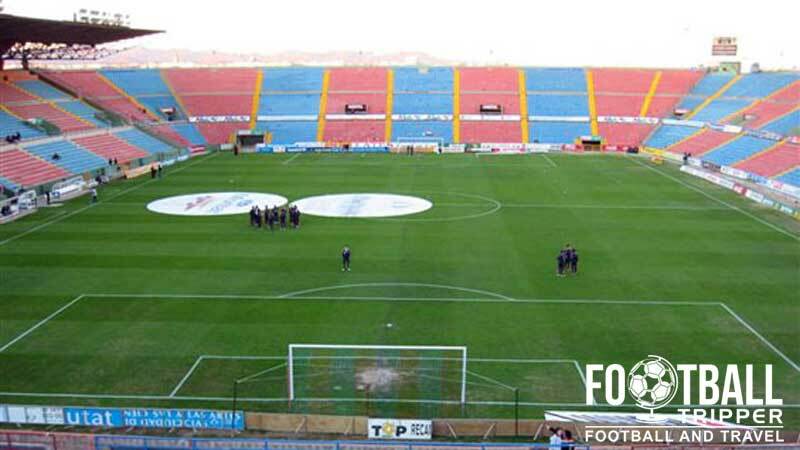 Tickets to see Levante play Football can be purchased either Online, at the taquilla (Ticket windows) at the stadium either in the week leading up to the match or even on the day as the home matches rarely sell out which is perfect for tourists. 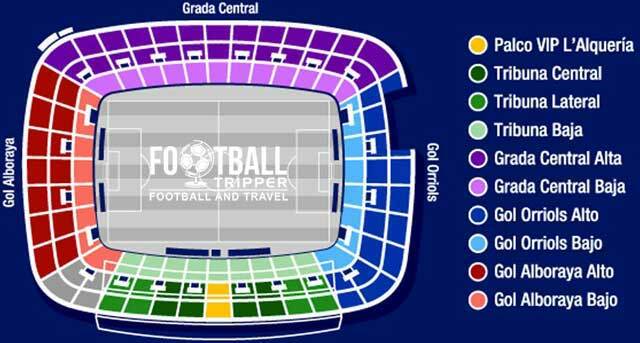 Pricing wise the stadium is generally divided into 8 areas with costs not only depending on where you sit, but who the visitors are, with a pricing range likely to be say €20.00 for a place behind the goal, or around €40.00 for the main stand. For more information, feel free to send an email to [email protected] and see what they come back with. Estadi Ciutat de València is situated in the North of the city centre, approximately 3.5km from what is regarded as the historic centre and around 4km from the main “North” railway station. A look at Estadi Ciutat de Valencia’s main stand. The ground is no more than 3.5km from the city centre whcih means you should be able to walk it in around 40-50 minutes. If travelling up from either the South or Western parts of the city look for signs for “Ronda Nord” and simply follow until you see Levante’s stadium on your right hand side. If coming from the North, you’ll probably be coming from out of town along the motorway Autovía V-21/E15 (north-east). There appears to be over 1,500 spaces within the adjacent Centro Commercial Arena Multiespacio which is free for 2 hours however anything after this will cost you between €5.00 – €10.00 euros. Other than that you will have to scramble around the nearby streets to find somewhere to leave your car. The largest railway station in Valencia is called as Estación del Norte and is slightly south of the Catedral and historic centre. Around 4km away from the stadium, you can either choose to walk it or catch either metro line 3 there which should take you no more than 20 minutes. Head in the direction of Rafelbunyol and look to get off at the Machado stop which is less than 10 minutes away, with the walk taking you past Burger King. Note: When you are there you may see the station referred to as Estació del Nord which is a slight variant of the aforementioned spelling. This is because some of the signs may be in Valencian dialect which has slight variances with “national” Spanish. One of the many matchday tram services which can take you to the stadium on match day. On match days buses usually depart every 20 minutes or so and take a similar amount of time to get to Ciutat de Valencia stadium. Look for either Bus 70 or Bus 11 which leave from either Pl. de Ajuntament or Palau de Justícia and try to get off at Alfahuir – Cercle de Belles Arts or Alfahuir Germans Machado which leaves you in a similar place to where the Metro line would take you. Once you have landed, you should get to the city in no more than 30-40 minutes depending on mode of transport taken; you have the choice of the A-3 Autovía motorway, bus services or the metro lines 3/5m, all of which are affordable and efficient. The closest hotel to the stadium is probably the Olympia Hotel which is northwards on the outskirts of town which makes it not the most desirable of places from a tourism perspective. Besides, this you’ll have to head back towards the city centre if you want more choice with Hotel del Carmen and Hotel Ad Hoc Monumental both doing a great job of bridging the trip to the stadium with the historic parts of town.